I wanted to bring back my very old post from a previous blog / now closed / because the Italian production of Jesus Christ Superstar starring Ted Neeley is still in Europe.. and seeing Ted in such tremendous form still, notwithstanding age, is an experience I highly recommend to any fan! Originally posted on October 2014. Say Jesus Christ Superstar and cue exhausted sighs of most unfortunate souls who share my home. The yearly return of JCS bug – it really comes back every year, on the clock, without any special occasion and without me even thinking about it – got really intense this time. My boyfriend, otherwise a firm lover of the rock opera in his own right (especially Carl Anderson’s Judas and Bob Bingham’s bass badass Caiaphas), complained lately “you are making me hate Jesus Christ Superstar!” and promptly demanded of me to shut up. Impossible: I will just yap away here. Jesus Christ Superstar was filmed nine long years before I was born (I am dating myself here, a child of the 80-ties Polish communist reality) and released two years before my parents met. I was not even a shadow of a thought in their minds, given that they were both dating other people back then. It isn’t played for Christmas or Easter on Polish TV. Finding out about it, as well as digging it from underneath the ground in the 90-ties in a little middle-of-nowhere town in Poland, was a labor of love. I heard the movie soundtrack first, like years earlier people listened to the 1970 album first, before it became anything more. And I fell in love. As far as I know, I am not the only one of my generation, whose heart was captured by this movie. What constitutes its enduring power? I don’t really know. I can feel it though. It seems that – like with most things that somehow become more than a mere sum of their parts – certain elements became interwoven so beautifully into a very real human story that they unavoidably created a new quality. Serene and heartbreaking, there is no escaping a mental entrapment within that reality. At least, not for me. The “mere parts” of this new quality can all be listed. It is a reductionist perspective, but I will attempt this route anyway, as otherwise I am simply at a loss for words. Does not happen to me too often, but when I watch this movie, my mind enters a permanent state of inner silence. There is a meditative quality to it, along with a healthy dose of exhilaration. A really weird combination, but somehow it works. Rock is the soul of this production, yet the lyrics in Jesus Christ Superstar are almost more important than the music itself. I am continuously surprised by how meticulously each character’s fear, want and desire are painted with very disciplined strokes of words. And if I am to be honest, I would have loved to listen to more of this content, it is so spot on. The lyrics humanize this story in carefully put together scenes: like with Jesus delivering a conditional agreement to his own demise, to be taken “before he changes his mind”. His attitude is unexpected, very human-like in doubt, anger and fear. At the same time, for a retelling of this story that emphasizes human and not divine, it never strays too far from what we accept now as part of official religious cannon. It is that, but with a twist of perspective. We observe the happenings through the eyes of Judas – who had serious doubts, putting it mildly, about this “Son of God” moniker his friend seemed to suddenly like – and partially through the eyes of other followers of Jesus, justifying the metaphor of his superstardom and a loyal fandom that misunderstands the man they adore. The pleasure of looking at the story we all know in a new light is endless. This retelling of the religious cannon through human reality offers such lovely moments as Jesus telling (singing to) his apostles to “stick to fishing from now on”, without the Gospel explanation of soul fishing. It works on so many levels that it makes this simple line seem suddenly new and just randomly funny at the same time. All of this is a testament to how deeply knowledgeable about those stories, as well as genuinely intrigued by them, was Tim Rice, the writer of this rock opera. I believe he was way deeper in this material than he was given credit for at the time. A physical space of the movie set, Roman ruins in Israel (different places, Avdat pictured above here), is another key aspect giving this film the transcendent quality. For a movie that works on a premise of a theater group re-enacting the story of Jesus with shortages in the “historically appropriate wardrobe” department, the idea of filming it right where the biblical story of Jesus happened is nothing short of genius. It connects the production to its very core: a story about people of a certain time living in a certain way right there and then. It gives the movie a quality of a historical painting, profound, still, as if stolen in time; as silly as this sounds with a bunch of hippies dancing around the desert. I would venture a guess that this was precisely the point: because the production does not hide that it’s of its times, we can easily follow contemporary parallels suggested in the Superstar title. This brings our interpretations into the current context. Yet through the beautiful historical setting and the feeling of a total authenticity we never stop believing the story. To me this creates a heady mix of surreal reality aided by beautiful music: like living inside a dream sequence and believing it is true at the same time. As he did with his earlier musical-turned-movie, Fiddler on the Roof, using a Yugoslavian village as a Russian Jewish shtetl, Norman Jewison (the director of the movie) films the Israeli desert beautifully. I would have never known that the desert could be this pretty: colorful and changeable, surprising. It is wide open, but it is also trapping and of the same nature. It offers a promise of release with a threat of imprisonment. Norman Jewison uses light and shadow, open merciless sun and windy shade to paint contrasts. While they give an impression of rich variety, after a while one realizes that it is almost like a transition from black to white, from one extreme into another. In this case from light grey into a glowing orange. This supplies the movie with a delicate tension, which feeds beautifully into the music. Another aspect of the movie, giving me an unending thrill of a new discovery pretty much every single time I watch it, is its symbolic quality. This actually requires its own blog post. I see layers upon layers of symbols everywhere. In its construction it is reminiscent of writings of not a well known Polish writer, Bruno Schulz, namely: symbolic orgasms of imagination. ** You can look through pretty much every scene in this movie and something about it will immediately hook your mind and transport it someplace else. Like the heart-wrenching commentary to choices of Judas or Pilate in a form of a choir (“Well done, Judas” or “My lord”) in pivotal moments for those characters, hinting at the underlying tragedy of their chosen paths like an ancient Greek chorus. *** I love it. I wonder how come those two are pointed to as tragic. What about Jesus? The mental travels I go on when watching this movie are… well worth the ride. I will write more on this in a new post, but now let me describe the incredible talent: people, who acted and sung this movie right into my heart. And let me start right from the top: Mr Superstar. Ted Neeley, I totally dig you as Jesus Christ! Mr Neeley embodies qualities both beautiful and unsettling, together forming a perfect canvas onto which a portrait of Jesus can be painted. Neeley’s Jesus is a guy, a good-hearted man with a sunny disposition, whenever he finds the energy to smile, which is rare. He is a vulnerable human being, sometimes cranky and irritable, who feels that the end of his days is not too far away, and has to come to terms with that perspective. He is tired. We are told that he spent three years trying to explain his wisdom to a group of well-meaning but rather dim-witted followers and increasingly rabid, difficult to control crowds. There is a quiet charisma to Neeley’s Jesus. From a delicate posture – this Jesus does not tower over his apostles, rather pulls them in by the willpower – through his wide set light eyes that give you this impression as if he was looking at you and through you at the same time to his voice of gentle amber baritone and rock rasp, this Jesus is all focus and intuition, insight and intensity. I will freely admit that Mr Neeley’s voice is a favorite of mine, knocking people like Robert Plant down the list. If you wonder why, listen to Gethsemane, which to me can be read as a metaphore of the universal human consciousness of death – or better yet, listen and watch his performance at the same time. This will have your skin tingling in pain, amazement… and your heart opening in empathy for another human being in this position (religious implications aside). No one can touch this performance, and I listened to a lot of people butcher Gethsemane (including the performance from the recent Arena Show, just… what a waste) to confirm my initial suspicion: not even one of them got close to what Ted offers artistically. He is the best. I love Ted Neeley’s voice, it just strikes a chord inside my heart and pulls me in. Arguably though film’s Judas is an even better vocalist. Judas and Jesus are a perfect match, beautiful opposites that play off each other’s emotional intensity, making the movie work on so many levels it simply blows my mind. Carl Anderson (sadly, gone – but his legend remains; it is one of the biggest regrets of my boyfriend and I, never having a possibility to see Carl live…) can be possibly considered the best voice of the 20th century. OK so I haven’t heard every single voice… and maybe comparisons like this are unfair. Still, his voice, difficult to describe, moves effortlessly from honey-like sweetness and warm depth through jazzy coloratura ornaments right into powerful solos and rock hoarse… To me his voice’s color is an equivalent of a sound rainbow. It is constantly changeable. Carl’s performance as Judas, passionate, doubt-ridden, pragmatic and above all … with a shattered heart hidden behind his pragmatism, is simply dynamite. 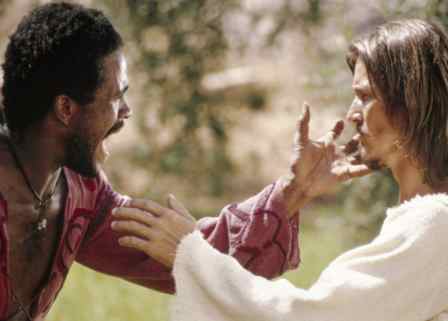 The electrifying chemistry between the two main leads can be best seen in the final showdown, the shouting-singing match between Jesus and Judas, before Judas runs of to bring in the Roman guards and betray Jesus, his friend. I have watched that scene countless times, and every single time I can feel their anguish and pain down to my stomach. I think both Ted and Carl are greatly appreciated as singers but under-appreciated as actors. The connection, relationship and intensity of feeling between them blows my mind into tiny little pieces every single time. I really loved listening to Ted’s own recollections as to why the two of them were cast in the movie. It is a rather lengthy listen but if you, like me, cannot get away from underneath the spell of this movie, chances are you will enjoy it as much as I did (while appreciating Mr Neeley’s comedic timing! ).The beautiful part comes at the end, and I totally see it in the movie. With regards to the rest of the cast, there might be a couple of weak links here and there, the future director of saucy films, apostle Paul, does not fully convince me with his talent, but overall I find this movie very well cast. A big respect goes also to all those lovely dancers sweating in the middle of Israeli desert in their mad moves, now beautifully frozen in time. This is where I stop myself in this attempt at describing what precisely touches my heart, or fires up my imagination, when it comes to Jesus Christ Superstar. The need to write down my thoughts is directly related to my absolutely impossible to contain excitement at the fact that in two weeks I will be in Milan, where the current production of this musical, directed by Massimo Pipparo, stars three actors/singers of the original movie. As I quietly loved Jesus Christ Superstar from far away, not even in my wildest dreams have I imagined that one day I’d be able to see Ted Neeley, Ivonne Elliman and Barry Dennen perform live. Counting days now! For now, the closing shot the movie. I will write about its symbolism in an upcoming post. I hope the mistakes that I make in English do not distract from the ideas I want to convey. I think whether or not one is religious influences the perception of the movie, but it can definitely be seen (enjoyed and absolutely loved) by not religious people. I am not very religious. I was brought up moderately-catholic, but I have never been deep into my faith. When I turned sixteen I decided to leave the church, not to be hypocritical – and partly out of respect for other people, who went there because it meant something for them. I was always a seeker though. I never turned staunch atheist – I consider it somehow akin to religion in a sense that it is a belief system that tells you “God does not exist”. I always asked questions. Long sixteen years later, grappling with ideas on whether the reality we live in is the only one that exists, or if a spiritual cosmic energy extends beyond the Maya that surrounds us, I watch this movie as a story of human experience, feeling, charisma, love, fear and endless possibility – and with the pleasure so new it never goes away. * Yes, my obsession brought me the torture of pop JCS versions of 2000+, stuff that should be buried deep within the vaults of YouTube, where dragons sleep – you know, like in Harry Potter inside the goblin’s bank, minus waking up the dragon, thankyouverymuch. Previous Post My travels: Zugdidi, Georgia. Samegrelo – the land of human kindness. Next Post My travels: Sparta of golden shadows, Sparti of life. Then and now.